A land rich with history, culture, and natural beauty, Vietnam is a destination for those seeking remarkable experiences. Located in Southeast Asia on the South China Sea, it is a country famous for its beaches, rivers, bustling cities, quiet villages, ancient temples and Buddhist pagodas. Travelers and adventurers from all around the world seek Vietnam to satisfy their cravings for colorful history, complex culture, incredible food, scenic views, and thrilling activities. It is well-known for its unique seascape, 1600 limestone islands, and islets. Most activities for tourists here are kayaking, trekking, cycling, snorkeling, swimming, and fishing. Ha Long Bay 170 km away from Hanoi which is 4 to 5 hours drive depending on the traffic. You can book a two-day and one night Ha Long Bay cruise. Located 70 km northwest of the city of Ho Chi Minh is the historical underground Cu Chi tunnels. It is comprised of more than 200km of complex tunnels that served as shelters and hideouts during the Vietnam war. Hue is a city full of historical sites, and their main tourist attraction here is the Imperial City Royal Palace. You can cycle from the city to reach Thuan An beach if you want to go swimming. Or drive for an hour to Lang Co or Canh Doung Beach. The business and financial center of Vietnam has the current population of over 7 million. Aside from its impressive skyscrapers, architecture, ornate temples, and pagodas, they also have restaurants featuring Chinese, French and Vietnamese cuisines and amazing rooftop bars. Walk around the city of Hanoi to explore crafts, cuisines, vibrant nightlife and diverse community. And, on the countryside, you can visit parks, mountains, and villages. Dive into history and get to know the country’s great leader at the Ho Chi Minh Mausoleum. From a port in My Tho, board a long-tail boat to cruise on the Mekong River. Explore and experience the vibrant waterways with fish farms, fruit farms and have a taste of tradition with Mekong Delta delicacies. Hoi An is the best destinations to dine and shop in Vietnam. During Lantern Festivals, the road from Hoi An Bridge going to Hoai River Square is lit up with thousands of colorful lanterns, food stalls, and festivities. From Da Nang International Airport, it only takes 1 hr or 30 km to reach Hoi An Ton and find a place to camp with your RV. Get the chance to go biking, hiking, paddling and explore the wonders of the karst mountains, jungles, rivers and caves at the Pho Nha-Ke Bang National Park. There are numerous trails in which you can choose. You can visit Phong Nha’s Wildlife Rescue and Rehabilitation Center, relax by the river, kayak on the lake and explore other parts of the park. Built in the 1880s, the Notre Dame Basilica is one of the few strongholds of Catholicism in Vietnam. It is a peaceful and serene view in the middle of the bustling downtown of Saigon. People visit the Basilica for its neo-Romanesque features, stained glass windows and bell towers. Learn about a first-person account of the war from veterans, see photographs and remnants of the brutal effects war in Vietnam. The displays and illustrations are rather disturbing and controversial. You can find the Remnants Museum Ho Chi Minh City. 350 km drive from Hanoi is the Sa Pa Valley. It is the home to several ethnic groups in Vietnam. Visitors are drawn here because of the beauty of the iconic rice paddies, the culture of the highland tribes and the challenge of trekking in the forest. With roots dating back to 11th century, this art form was inspired by villagers performing entertainments in the waist-deep waters of flooded rice paddies. Accompanied by live music, no more than eight puppeteers perform behind the bamboo screens. Their amazing show is truly unique only to Vietnam. Found inside the DMZ, the Vinh Moc Tunnels are bomb shelters used by civilians during the bombing raids. Its located just 37 km north of Dongha. Situated between Hanoi and Ho Chi Minh is the fourth largest city of Vietnam, Da Nang. Relax in a spa, go off-roading in the jungle, surfing, tour the old Demilitarized Zone or take a cooking class conducted by local restaurants and five-star hotels. Find old temples, towers and stone sculpture at the Hindu ruins of My Son Sanctuary. It is just a short distance of 70 km southwest of Danang, or 40km if you are in Hanoi. There is a parking lot designated for visitors where you can park your RV. It is just a short distance away from the sanctuary. A five-hour drive from Ho Chi Minh City is the Mui Ne Beach. It’s a traditional fishing village that became a popular destination for its serene view that is perfect for walking, jogging, and watching the sunset. It is Southeast Asia’s largest Buddhist complex. Consists of many temples and 500 statues of Buddha, people flock to this site to pay respects and ask resident monks for their fortunes. Take the world’s longest over-water cable car to reach the island. Here you can find Vinpearl Land whose attractions include an aquarium, musical fountain, water park, theme park and restaurants. Famously known as ‘Le Petit Paris,’ complete with its own small replica of the Eiffel Tower. Da Lat boasts farmlands, landscapes, forests and small villages. It is a nice place to stay cool, relax and take a break from the hot and humid temperatures of other cities in Vietnam. Enjoy the fresh waters of the Quay Son River at the Ban Gioc Waterfalls. You can ride bamboo rafts to get close enough to feel the spray of water or swim in its large pools. The isolated appeal of Lan Ha Bay is great for sailing and kayaking trips. It is a 2 hours trip to the south of Lan Ha Bay. They have the perfect beaches for romantic getaways or just a way to escape the city life. It is located far in southern Vietnam, just 45 km west of Ha Tien. This park is home to 32 types of mammals and 70 bird species. The most challenging hiking trail here is 18 km and takes up to six hours to accomplish with a guide. Enjoy the scenic landscapes only seen in the Hai Van Pass as you take the long winding road from Da Nang to Hue. It is a 25km mountain pass popular among motorcyclists, so be very careful when you are planning to drive your RV through this incline. A 10km expanse of pristine waters, palm trees, and fine sand. You can find several accommodations here, including camping facilities where you might want to take your RV. It is an astounding 6 km stretch of coastline with white-sand beaches, bio-diverse waters, green mountain ranges, and 19 untouched islets. There are countless of sights, recreational activities, and attractions in Nha Trang that can keep you entertained for days. Located 65 km south of Hanoi, which is about 2 hours drive, is this Buddhist shrine sitting at the cast grotto of Huong Son mountain. It is a 2km hike up the mountain, or you can take the cable car instead. Tourist gathers into this temple to tour and take pictures of Caodaists pray. It is important to stay silent during services and only watch from the galleries. It is a group of islands at the southeast coast of Vietnam. Visit these islands from June to August to witness the peak of nesting season of turtles. One of the most visited pagodas in Vietnam, the Thien Mu Pagoda or Pagoda of the Celestial Lady is seven stories high. It is regarded as the most beautiful and sacred temple in Vietnam. This complex is a popular destination when visiting the city of Nha Trang. It is 2 km north from the city center. A festival is held here every 21st and 23rd days of the third lunar month in honor of the Goddess Po Nagar. It is the largest national park in Vietnam. By visiting the site, you are also helping in protecting the park’s wildlife as well as the local economy. The Vung Tau Island is the first popular destination for tourists in Vietnam. It is popular amongst families and other travelers. Activities include playing in the golf course, watching dog racing swimming, and snorkeling. The oldest Buddhist temple in the city of Hanoi. It was relocated on this islet at the West Lake in 1615. It is a place of worship so it could be quite crowded during festivals. The world’s largest natural cave, Son Doong is house to stalactites, stalagmites, limestone grottoes, and a variety of wildlife that includes monkeys, bats, and flying foxes. It has sections which reach up to 200 meters and spans 9 kilometers. It is within the Pho Nha-Ke Bang National Park, which is also a great place to camp with your RV. The highest peak in Indochina. You can reach the summit in two days on foot and just 20 minutes via cable car. It is just 9 km away from the town of Sa Pa. It is a mausoleum built for the twelfth of the Nguyen dynasty, Khai Dinh. Situated at the Chau Chu mountain, 8 km south of Hanoi. Visitors have to climb up 127 steps to reach the tomb. This river is a big part of the traditional and historical heritage of the people of Hoi An. Travelers can rent a boat to see the sights and discover beautiful villages along the river. You can find this beautiful and tranquil sight in a park in the Ba Dinh District. This majestic pagoda rise in the center of a lotus-shaped pond. Families with children will love this theme park located 15 km south of the city of Ho Chi Minh. It is a Buddhism inspired water park with water slides and many huge scale structures. The best time to visit here is during the Buckwheat Flower Festival held around October to November every year. You can travel here through the Can Ty Pass, 43 km from Ha Giang City going to Quan Ba. Mid-way between Dalat and Ho Chi Minh is a 720 square kilometers of protected tropical rainforests. You can go on a trek, bike, kayak, take a boat trip, night safari or go bird watching. The 20m bridge sits atop the Thu Bon River, connecting the Tran Phu St, and Nguyen Thi Minh Kai St. If you want to take great photos of it, visit during the night as lights complement its design well. Take a cooking class as Hoi An’s Thuan Tinh cooking school island. 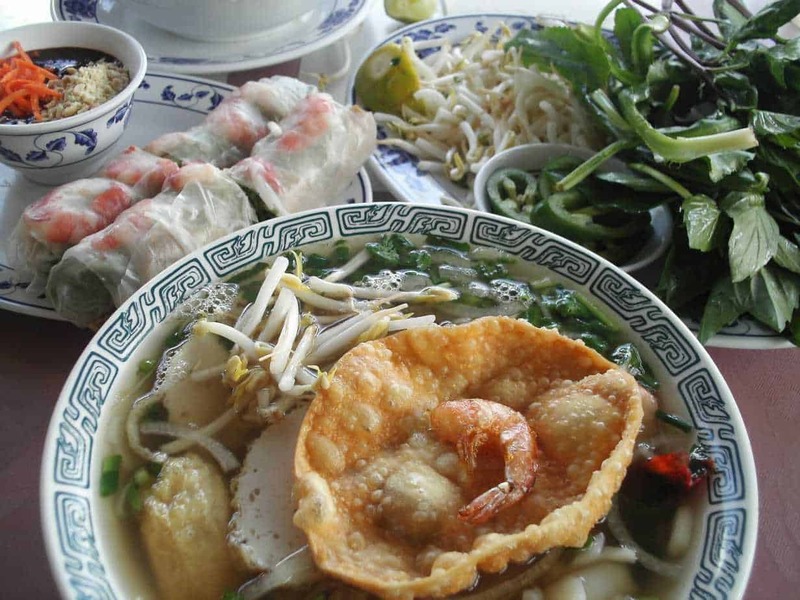 You can learn how to make Vietnamese dishes and enjoy eating it afterward. Encompassing 154 square miles of protected land covered with forests, hills, mountains and a lake is Bach Ma National Park. It is 32 km South of Hue City. Staying overnight in the RV might be a good idea after all the activities, so make sure that you have a good working air conditioning system to help you sleep comfortably in the hot and humid weathers. Travel 70 km north of Phong Nha-Ke Bang National Park, to explore, swim, and camp on the Tu Lan Cave system. The tour will include a 9km trek through buffalo fields, jungle, and rocky terrains. A place worth to visit because of their beautiful rice terraces and ethnic villages. You need at least two days to visit the province as traveling the 70 km winding road from the city takes time. 200 km from Ha Noi is the stunning tea plantations in Moc Chau plateau. It is becoming more popular as more travelers get to know the picturesque fields of different kinds of flowers. 200 km north of Ho Chi Minh is the beautiful beach of Phan Thiet. You can find a selection of restaurants and accommodations. Visit the pagodas, golf courses, red and white dunes or play water sports. 850 hectares of Tra Su Forests serve as a sanctuary for numerous species of birds and other animals. It’s located 20 km from Chau Doc and the tour last for about 3 hours. From mountains, forests, villages, cities, rivers lakes, and beaches. Vietnam would never run out of things that you can do. The rich history, culture, and diversity blend so well in this land that is rich in beauty and nature. Truly, it is a gem of Southeast Asia.